Search vs. Display Advertising: Which Is Better? Inbound may be king of the marketing world, but that doesn’t mean outbound marketing methods can’t fit seamlessly into your marketing strategy. In fact, either approach by itself won’t cut it. As the digital world evolves and becomes more crowded, it’s becoming increasingly difficult for any company to stand out. Luckily, outbound methods like search and display advertising are great for building brand awareness and demand generation. Especially for newer B2B companies who are ramping up and don’t have a ton of content in the beginning, search and display ads can amplify your inbound content, helping you gain traction and build domain authority. What is Search and Display Advertising? Search and display advertising are both methods of paid advertising through Google’s search network. Search engine advertising allows companies to bid for ad placement for certain keywords in Google’s sponsored links. When you search for a specific keyword or phrase in Google — let’s say,“new breed marketing” — the first two or three results are typically paid search ads. Through a combination of both your bidding strategy and quality score, you can ensure your page shows up first in the list of results. 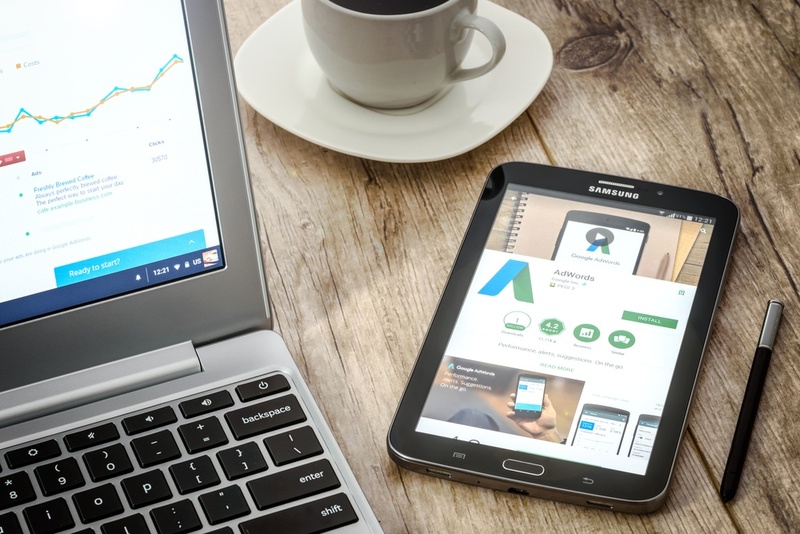 Display advertising, on the other hand, allows you to create audiences within Google Ads and serve banner ads to them through the Google display network. This feature tracks users’ behavior and helps make sure that the right ads are put in front of the right people, wherever they may be on the internet. You may be wondering: which is better for my business? The answer to that is, well, it depends. Each method has its own pros and cons. Search advertising is particularly effective for competing with other brands. For example, if you google “inbound marketing,” HubSpot shows up as the top result organically, but Pardot has bidded on this keyword, allowing them to show up above HubSpot in a search ad. Search engine ads are also good for targeting qualified leads because you have to consider search intent when bidding on a keyword. Consider your buyer personas and the relevant keywords they’re likely to search. Just because “how to make slime” was one of the top Google searches in 2017 doesn’t mean you should bid on it (unless your business offers, maybe, a slime-making service). However, unlike search ads, display ads are great for driving people to take action. That’s not to say search ads can’t drive conversions, but having an image banner comes with unique benefits. You can use it to convey compelling messages and attractive CTA buttons, and this type of branded imaging can boost click through rates. There’s also more flexibility with display ads because there’s no character limits — but be careful because Google will flag ads for certain messages if they’re deemed coercive or inappropriate. Furthermore, display ads are effective tools for remarketing. When someone visits your website, the display ad can follow them around the internet, subtly reminding them about your brand until they’re ready to re-engage with it. Ultimately, the method you choose depends on your business. Consider the goals of your marketing campaign and work backwards from there. Do you want to keep your brand top of mind and encourage someone to take action? Display ads are great for that. Do you want to maintain your position as a thought leader in the industry? Search ads are probably the way to go. You might even find the best path to reach your goals is to use each method in conjunction with each other. Whatever you choose, remember that these outbound marketing efforts should supplement your inbound marketing strategy, not the other way around. While designing and implementing search and display campaigns, keep the customer in mind throughout the entire process to maintain inbound best practices. Once you’ve made your decision, make sure you’re collecting data on how your ads are performing. A/B test different ads to see what your audience is engaging with and use that data to optimize your approach. Check in on your ads periodically to make sure Google is still serving them and see if you’re over- or underspending on certain keywords. Without these insights, you won’t understand how effective — or ineffective — your ads are, and you won’t be able to properly adjust them to improve their performance. Search and display ads are great ways to boost brand awareness and demand generation. These methods can be used together or separately help you reach your marketing goals — whether you’re looking to acquire new customers or market a new product. How you use them is up to you. However, search and display advertising shouldn’t be the main pillar of your marketing strategy. Use them with inbound best practices in mind to maximize their value. And as always, don’t forget to measure your results and optimize accordingly.